A Naval Aircrewman observes from a MH-60S Seahawk helicopter as simulated fast attack craft approach the Wasp-class amphibious assault ship USS Kearsarge (LHD-3) during a Surface Warfare Advanced Tactical Training (SWATT) exercise. The Kearsarge Amphibious Ready Group (ARG) recently completed a Surface Warfare Advanced Tactical Training (SWATT), the first time the such an exercise was conducted off the East Coast and signifying the Navy’s commitment to standardize training for both Pacific and Atlantic-based amphibs. USS Kearsarge (LHD-3), a Wasp-class amphibious assault ship, and its ARG are preparing for an upcoming deployment. The SWATT exercise, led by warfare tactics instructors (WTIs) from the Naval Surface and Mine Warfighting Development Center (SMWDC), provides the ARG a chance to synchronize its warfighting capabilities before starting integrated training with the Marine Expeditionary Unit (MEU). The Kearsarge ARG SWATT also marks an important milestone for San Diego-based SMWDC. For three years the center has worked to create surface warfare subject matter experts. As SMWDC has grown and evolved its role in the fleet, it is now bringing its amphibious warfare expertise and standards to the East Coast. “Kearsarge ARG’s SWATT was an important step in our development of a standardized syllabus for ARG SWATTs in both the U.S. Pacific Fleet and U.S. Fleet Forces areas of operation. 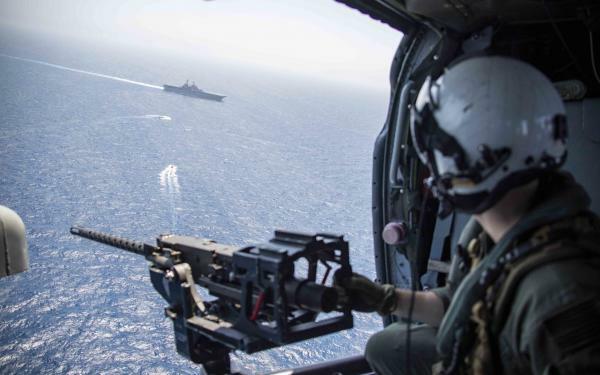 ARG SWATTs are key training opportunities for Navy watch teams, ships, and Sea Combat and Air Defense Commanders to practice sea control operations together before adding the complexity of the Marine Expeditionary Unit (MEU) during the integrated phase of training and deployment certification. This ensures that our Fleet Commanders have the most ready and lethal forces available to them,” SMWDC commander Rear Adm. Dave Welch said in a statement to USNI News. SMWDC started operating in June 2015, as a counterpart to the Naval Aviation Warfighting Development Center (Top Gun), the Undersea Warfighting Development Center and the Naval Information Warfighting Development Center. The idea is for the center to develop subject matter experts in surface warfare – the WTIs – who will also advocate for the surface community’s warfighting needs, according to the Navy. During the SWATT, Kearsarge ARG sailors completed air warfare exercises, live-fire exercises and simulated torpedo attacks. Using replay tools to provide real-time feedback, the WTIs can improve a watch team’s performance each time an advanced training event was completed. “The placement of SWATT before the ship’s last two major work-ups was great for the crew,” Capt. Jason Rimmer, Kearsarge’s executive officer, said in the Navy news release. 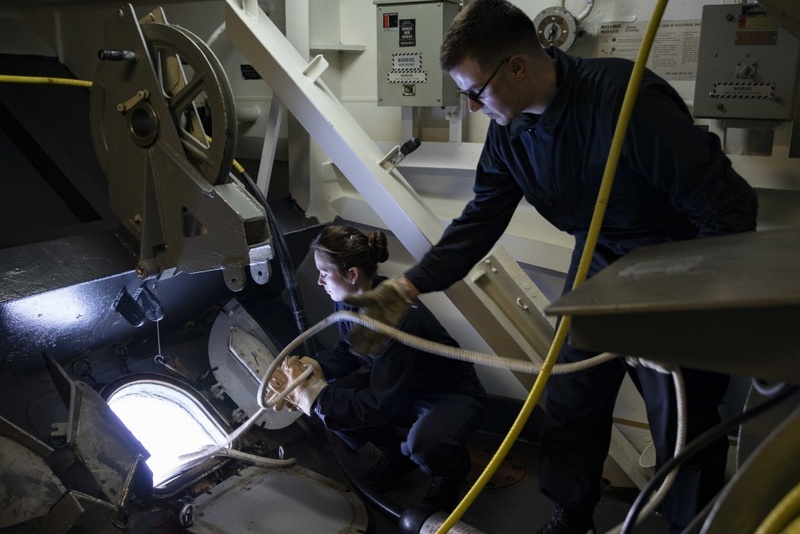 Cryptologic Technicians let out the fiber optic towing cable of the SLQ-25A NIXIE aboard the USS Kearsarge (LHD-3) during the Navy’s first Amphibious Ready Group (ARG) East Coast Surface Warfare Advanced Tactical Training (SWATT) exercise. U.S. Navy. The Kearsarge ARG consists of PHIBRON 6, Kearsarge, San Antonio-class amphibious transport dock USS Arlington (LPD-24) and Whidbey Island-class dock landing ship USS Fort McHenry (LSD-43). Kearsarge returned from a seven-month deployment to the Middle East in April 2016. 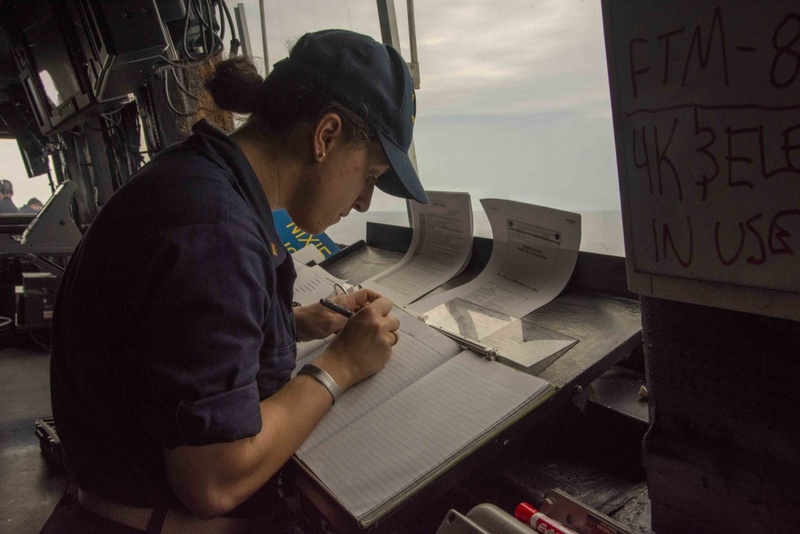 Last summer, Kearsarge spent two-months in the Caribbean providing hurricane disaster relief.